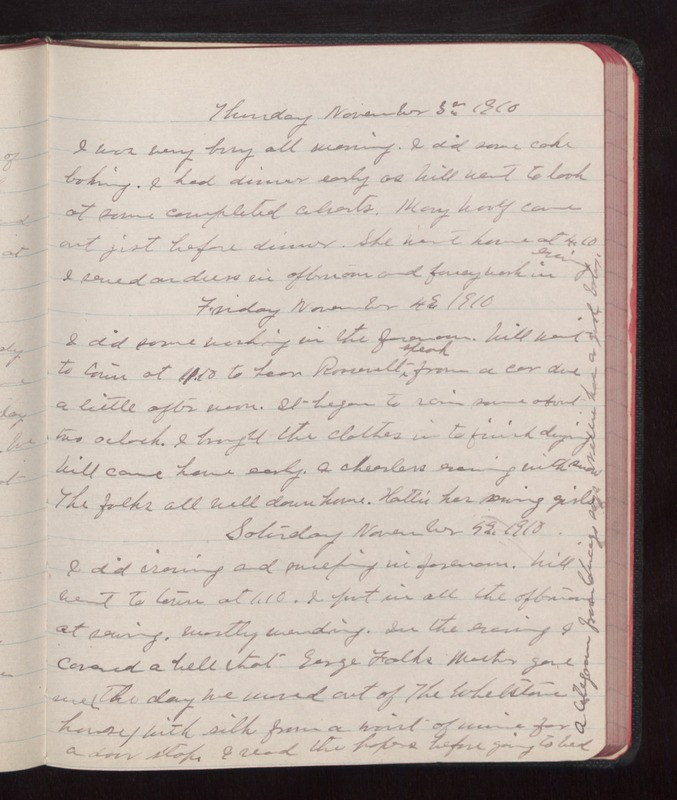 Thursday November 3 1910 I was very busy all morning. I did some cake baking. I had dinner early as Will went to look at some completed [charts?]. Mary Woolf came out just before dinner. She went home at 4.10 I sewed on dress in afternoon and fancy work in evening Friday November 4, 1910 I did some working in the forenoon. Will went to town at 11.10 to hear Roosevelt speak from a dar due a little after noon. It began to rain some about two oclock. I brought the clothes in to finish drying. Will came home early. A cheerless evening with snow The folks all well down home. Hattie has [sewing?] girls Saturday November 5 1910 I did ironing and [illegible] in forenoon. Will went to town at 1.10. I put in all the afternoon at sewing. Mostly mending. In the evening I covered a [bell?] that George Falks Mother gave me (the day we moved out of the Whetstone house) with silk from a waist of mine for a door stop. I read the papers before going to bed A cablegram from Chicago says Nellie has a girl baby.